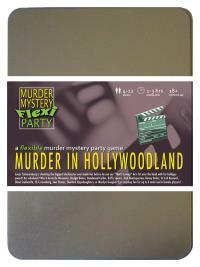 You've been invited to play the role of MARILYN GUNGHO in Murder in Hollywoodland. You're invited to a star-studded yacht party, as Lucas Cameronburg is shooting the biggest blockbuster ever made! But before he can say "That's a wrap! ", he's hit over the head with his Goldguy award and pushed overboard! Join us to find out who cut Cameronburg from his own film! With blonde hair falling in luscious waves and your irresistable red lips, you look every inch the Hollywood starlet. Your long satin evening gown is slit to the waist to make it easier for you to perform your kung fu moves and your clutch bag contains ninja stars and nunchucks. Gosh, I’m Marilyn Gungho, the screen siren that mixes martial arts with mascara. I love puppies, make-up and automatic firearms - but not as much as the camera loves me! Cameronburg cast me as a life-size marionette who comes to life and attacks its maker. How fun is that? I know I’m currently a nobody but this movie was going to launch my career into the stratosphere! And before anybody asks, I wasn’t anywhere near the yacht when Lucas was killed. I left at midnight to go for a quick run around the marina and didn’t get back until lunchtime. Now boys, I’m wondering... are you all packing heat tonight or are you just pleased to see me?